Verdetta Hahn Seabaugh, 104, departed this life Wednesday, Feb. 16, 2011. She was born Jan. 5, 1907, in rural Bollinger County, to E.H. and Lucretia Slinkard Conner. Verdetta and Lester Hahn were married Feb. 7, 1930. He passed away Feb. 7, 1975. She and Herbert Seabaugh were married Feb. 14, 1978. He passed away Oct. 29, 1986. Verdetta was a retired teacher. She began her career in rural one-room schools of Bollinger County in 1924, and finished the last 14 years of her career at the Woodland School District, retiring in 1972. She was named as one of the outstanding teachers of America in 1972. She was a member of Marble Hill United Methodist Church and United Methodist Women. She was a member of Beta Gamma, a chapter of Alpha Delta Kappa, a sorority for women educators. Verdetta was also a member of Bollinger County Historical Society, Missouri State Historical Society, Missouri Retired Teachers Association and area Retired Teachers Association. She was also a former Rebekah Lodge member. Survivors include two children, Carol and husband Bob Angle of St. Louis, Gary and wife Louise Hahn of Marble Hill; a daughter-in-law, June Hahn of Frisco, Texas; two stepdaughters, Virginia and husband Robert Dolle of Cape Girardeau, JoAnn and husband Ronald Ward of Scott City; five grandchildren; five stepgrandchildren; 25 great-grandchildren; and eight great-great-grandchildren. 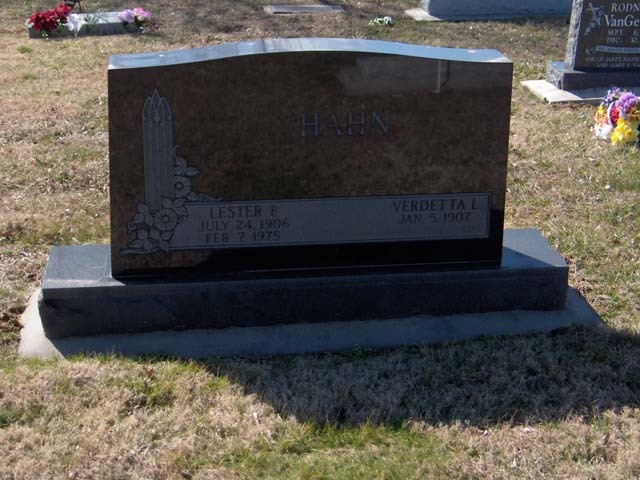 Verdetta was preceded in death by a son, David E. Hahn; her parents; a brother, the Rev. Howard Conner; and a sister, Norma Nipper. Visitation will be from 4 to 8 p.m. today at Liley Funeral Home in Marble Hill. The funeral will be at 2 p.m. Saturday at Marble Hill United Methodist Church, with Janet Hopkins officiating. Burial will be in Bollinger County Memorial Park Cemetery near Marble Hill. In lieu of flowers, memorials may be made to United Methodist Church of Marble Hill.